BRIGHT SUNSHINE and record crowds contributed to another successful Burston Rally. It was on 1st April 1914 that children of the Norfolk village went on strike to support their teachers who had been sacked for organising agricultural workers. Every September the Labour Movement meets on Church Green to celebrate the event that was the longest strike in British history. LABOUR HAS opened up a four-point lead on the Conservatives in the latest opinion poll. 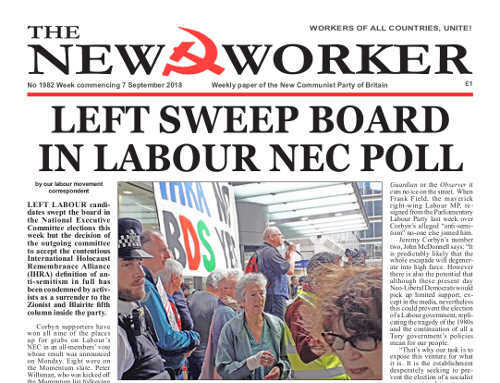 This is despite the backstabbing of the Blairite fifth column who are working with the Zionist lobby and the rest of the bourgeois media to topple Jeremy Corbyn before the next election. THE DEMAND for Britain’s railways to be taken back into public ownership reached a crescendo last month with passenger complaints over shoddy services and soaring prices peaking over the collapse of the Virgin Trains East Coast franchise and the recent rail timetabling chaos concerning Northern Rail, Southern and Thameslink services. They have, once again, highlighted the shambles of our privatised rail network. But what is the Tory government’s response to the public outcry?